Competitive Super Smash Bros. players will have to adapt to some mechanic changes for edge-grabbing. Super Smash Bros. director Masahiro Sakurai announced in Miiverse today a change to "attack and defense options for grabbing edges." In the picture Sakurai posted, Link and Mario both attempted to grab the edge of the stage, but Link trumps Mario's grab. The changes to edge-grabbing mechanics for the upcoming Super Smash Bros. could mean slight or drastic changes depending on players' style and level of play. In the past, competitive players discovered the advantages to guarding and hogging edges to prevent other players recovering. By already holding onto the edge near to the falling player, recovery is made significantly more difficult. Sakurai did not explain the changes in depth, but he noted, "Air time and accumulated damage will determine your period of invincibility while hanging on an edge," and "Grab controls will no longer be affected by whether you have above or below 100% damage." In previous Smash Bros. games - especially in Super Smash Bros. Brawl -- edge recoveries depended on the amount of damage. 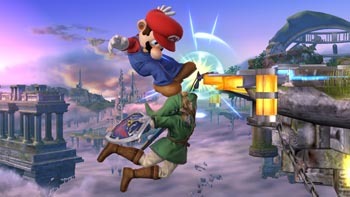 Players with less than 100% damage hanging on to an edge and recovering will do so quickly and deal little damage to an opponent standing nearby. With at least 100% damage, the recovery is slower and does slightly more damage. The duration a player can hang on the edge also depends on the amount of damage. The changes suggest camping out on edges can be countered. However, for now how air time and damage affects the duration of edge-hanging invincibility is unknown. Hopefully Super Smash Bros. for the 3DS and Wii U will be more balanced, which is something Sakurai is striving toward.